The sitter [1846-1915]; by inheritance to his sister, Louise Barnum Robbins, Adrian, Michigan; by inheritance 1918 to the sitter's niece, Mrs. Arthur L. Fuller, Chicago; Richard Creifelds; sold 13 February 1919 to Thomas B. Clarke [1848-1931], New York; his estate; sold as part of the Clarke collection 29 January 1936, through (M. Knoedler & Co., New York), to The A. W. Mellon Educational and Charitable Trust, Pittsburgh; gift 1942 to NGA. Letter of 29 May 1919 from E. N. Smith to Charles Harris, agent for Clarke (in NGA curatorial files), traces the descent from Barnum to Robbins to Fuller. A copy of Portraits by Early American Artists of the Seventeenth, Eighteenth, and Nineteenth Centuries Collected by Thomas B. Clarke (Exh. cat. Philadelphia Museum of Art, 1928) annotated with information from files of M. Knoedler & Co., NY (copy in NGA curatorial records and in NGA library). specifies this work was sold to Clarke by R. Creifelds, presumably Richard Creifelds (1853 1939), an American artist whose work Clarke also collected. "Auction Sales," International Studio 99 (May 1931): 59. Exhibition of Portraits by Early American Portrait Painters, The Union League Club, New York, February 1924, no. 11. American Painting, Art Resources Traveler (Artmobile), Illinois, 1967. The support is a medium-weight, plain-weave fabric that has been lined. Under the thick layers of paint the ground appears to be white and very thinly applied. In the layers of paint the brushstrokes are strong and expressive and there is evidence of wet-into-wet application, especially in the beard. X-radiography reveals the portrait of a woman beneath the present portrait. Whether this earlier painting was by Duveneck is unclear, for its handling is quite different, with more finely blended brushstrokes. 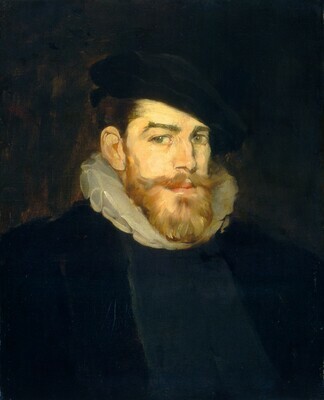 In several places details from the first portrait were incorporated by the artist into the subsequent painting; this is most evident in the eyebrows, which are actually exposed areas of the painting below. The painting is generally in good condition, but does have some areas of loss and abrasion. The thick and discolored varnish obscures the image significantly, especially in the darkest areas. Barker, Virgil. "Portraiture in America before 1876." The Arts 13, no. 5 (May 1928): 286. Sherman, Frederic Fairchild. "Frank Duveneck." Art in America 16 (February 1928): 97. Antiquarian 12 (June 1929): repro. 41. Heerman, Norbert. Exhibition of the Work of Frank Duveneck. Exh. cat. Cincinnati Art Museum, Cincinnati, 1936: 74. American Paintings and Sculpture: An Illustrated Catalogue. National Gallery of Art, Washington, 1970: 50, repro. Booth, Billy Ray. "A Survey of Portraiture and Figure Paintings by Frank Duveneck." Ph.D. dissertation, University of Georgia, Athens, 1970: xiii, 85-87, repro. American Paintings: An Illustrated Catalogue. National Gallery of Art, Washington, 1980: 147, repro. American Paintings: An Illustrated Catalogue. National Gallery of Art, Washington, 1992: 163, repro. Kelly, Franklin, with Nicolai Cikovsky, Jr., Deborah Chotner, and John Davis. American Paintings of the Nineteenth Century, Part I. The Collections of the National Gallery of Art Systematic Catalogue. Washington, D.C., 1996: 152-154, repro.